On the art front, Will Sliney doesn’t let up on the awesomeness. He REALLY knows how to draw action pages. There’s some great page layouts in this issue, and a fantastic last page that is a real high to end the book on artistically. 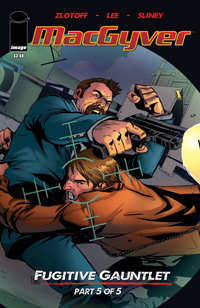 I’ll miss you drawing MacGyver, Will, but I will see you in the pages of Fearless Defenders. Good work, my friend. Thank you, Lee David Zlotoff! Thank you, Tony Lee! Thank you, Will Sliney! Thank you, Image Comics!! I never thought that I would get to read a MacGyver comic book, and not only did I get one, I got an OUTSTANDING one!!! Here’s hoping that we get more MacGyver in the future! !